This bitter melon recipe pairs two strong flavors—and bitter melon, a vegetable with a strong chalky flavor. Bitter melon is a bit of an acquired taste—parboiling makes it less overpowering. 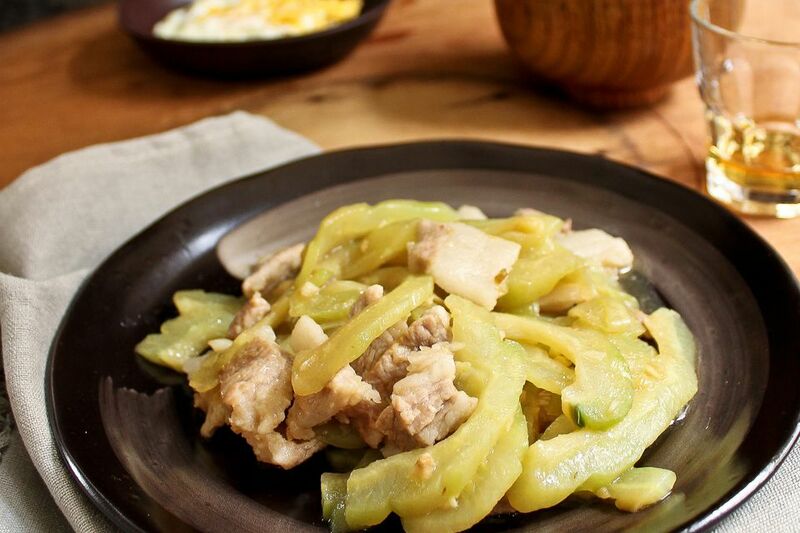 Pork with bitter melon could serve 3 to 4 as part of a multicourse meal, or make a main meal for 2 when served over rice. Cut the ends off the bitter melon and cut in half lengthwise (do not peel). Remove the seeds and pith from the middle of the melon with a small spoon. Cut the melon diagonally into thin, 1/4-inch slices. Place the sliced bitter melon in the boiling water and parboil until it is just tender (2 to 3 minutes). Drain and set aside. Cut the pork across the grain into very thin, 1/8-inch thick slices that are 1 1/2 to 2 inches long. Place in a bowl and add the soy sauce, 2 teaspoons of the rice wine or sherry, sugar, pepper, stirring to combine. Add the cornstarch last, stirring well. Let the pork stand at room temperature while preparing the other ingredients. In a small bowl, combine the chicken broth and remaining 1 tablespoon sherry. In a separate small bowl, dissolve the cornstarch in 1 tablespoon water and set aside. Rinse the black beans to remove excess salt. Mash the beans with the side of a cleaver or the back of a spoon. In a small bowl, stir together the beans and chopped garlic with a small amount of water. Heat 1 tablespoon oil in a preheated wok. When the oil is hot, add the bean-garlic mixture. Cook, stirring, for about 15 seconds until aromatic, then add the pork. Stir-fry for 2 to 3 minutes, until the pork turns white and is nearly cooked. Remove the pork from the pan. Heat 1 to 2 teaspoons oil in the wok, as needed. When the oil is hot, add the bitter melon. Stirfry for a minute, then pour in the chicken broth mixture. Add the pork back into the pan, stirring to mix everything together. Cover and simmer for 2 minutes. Re-stir the cornstarch/water mixture. Push the other ingredients to the sides of the wok and add it to the chicken broth in the middle of the wok, stirring to thicken. Stir everything together, stir in the sesame oil, and season with salt or pepper if desired. Serve hot.